We had a very successful time of it at the Meetings Show recently, with the inaugural appearance of our lounge concept going down extremely well with those in attendance. Implemented to cater for attendees looking to engage in productive meetings and conduct networking, we set out to demonstrate the benefits of providing a dedicated space to allow personal and semi-secluded interaction between exhibitors and buyers. Utilising integrated technology, including in-built wireless charging and the Samsung Flip, we were able to deliver an advanced experience for delegates, as we presented our vision for the meeting space of the future. 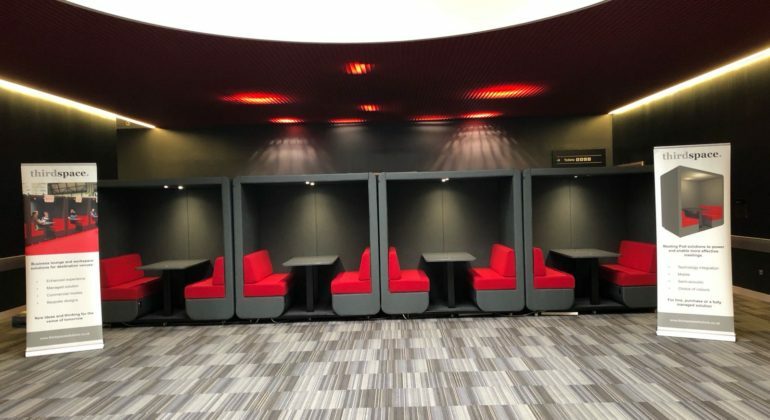 The lounge featured the latest in meeting pod design with embedded wireless power charging, LED lighting and comfortable seating, along with a breakout area with sofas. The space provided those in attendance with an area in which to conduct meetings, speed network, and simply stay connected and catch up on work throughout the day. In addition to the Meetings Show, our solutions were also in place at the AEV Conference, that is the Association of Event Venues, which coincided with the Meetings Show. A cluster of our meeting pods were located in the main entrance to the conference, for use throughout the day – offering the optimum setting in which conference delegates could interact and engage with one another. The theme of the AEV conference was focused on ‘tomorrow’s world’ and what the future holds for the event venue industry. With our solutions very much catering for the venue of the future, it was an excellent opportunity to demonstrate how venues can take advantage.